Alexis is shifting uncomfortably in his seat. He seems somewhat embarrassed as he begins to answer, his eyes fixated shyly on the desk before him. He is wearing a red sweater and sports a carefully curated hairdo, long sideburns and all. He looks like a student in the principal’s office -which he is, in a sense- but his words flow confidently. “That’s not exactly what we mean”, he corrects the interviewer. It is the winter of 1990 and he, the president of his school’s student board, is giving a one-on-one interview on national television, trying to explain why so many public schools around the country have been occupied by students protesting a new education bill. “We would like it to be our right to decide if, at some point, we want to skip class”, he finally says. And as the final words come out of his mouth, he raises his eyes and looks at the interviewer. He is 16, and he looks shy, but also defiant and determined. This time there is no shyness. Alexis Tsipras is giving his first television interview as the president of Synaspismos, a small leftist political party. He is now a grown man, confident, eloquent and comfortable. His hair is much shorter. He looks at his interviewer’s eyes constantly. “I will be honest with you”, he admits with a hint of a smirk. “We are not ready. We do not have an alternative proposal to rule. This is our great challenge now. To build a proposition. To become ready”. He is 34 years old, the youngest political leader in the country’s history. He may not be ready, but by the end of the sentence, he is beaming. Shyness is now a distant memory. Alexis Tsipras stands behind a podium against a background of retina-searing blood red. He is speaking before a crowd of party enthusiasts, mostly farmers, in the small town of Lamia. His delivery is very different - he speaks slowly, and very loudly. He is wearing a suit with no tie. He is gesticulating fiercely. “The markets are doing their job, which is to profit”, he yells. “We’re doing our job, which is to serve the interests of the Greek people. What is important is who plays the tabor. We will be the ones playing the tabor, and the markets will be the ones dancing”. It is November. He is 40 years old, and the election for a new Greek President from the parliament has just been moved up to next month. It is a process very likely to fail, in which case a snap general election will be called for early 2015. For the first time, Alexis Tsipras has a clear chance to rule. On that podium, yelling, he appears to feel ready. Alexis Tsipras may be just days from becoming Greece’s next prime minister. At 40 he would be the youngest leader the country has seen, and the first from a radical leftist party in the history of the republic. These facts would be noteworthy and interesting by themselves. But Greece is a country in turmoil, still mired in recession, indebted and structurally bankrupt. Its woes have sent shockwaves throughout Europe and have completely transformed the political landscape within its borders. In such a volatile political and economical climate, the idea of a passage of power to a virtually unknown and untested political entity, cobbled up by tiny leftist fragments of the political fringes, and led by a young politician with little experience and seemingly naive notions of revolution and change, triggers more than just fascination in Greece and abroad. But is that fear justified? Alexis Tsipras was born in Athens on July 28, 1974, just four days after the brutal seven-year military junta ended and democracy was restored in Greece. He is the youngest of three children, born to a civil engineer and a housewife and raised in down-town Athens. Politically active from a very young age, Tsipras became a member of the Communist Youth at 14, while in high school. He was elected president of his school’s student board and achieved national notoriety during the high school uprising of the winter of ’90-’91, when most schools in Greece where shut down by students protesting an education bill introduced by the New Democracy government. After finishing high school, Tsipras left the Communist Youth, but continued to be politically active within a more moderate branch of the Left. He studied civil engineering in Athens, and became a prominent participant in university student politics, a field that is highly politicized in Greece, as well as a natural breeding ground for future political stars. Andreas Karitzis, a member of SYRIZA’s Central Committee today, was also a student at the Polytechnic at the time and became friendly with Tsipras. “He was always decisive and a pragmatist, a doer”, he remembers. Although his department was small and his political group’s clout limited, he became a fixture in campus politics, drawing fans and enemies alike. “He had an uncanny ability to identify achievable goals and do whatever necessary to achieve them”, says Karitzis. After they finished school, they both joined the youth chapter of Synaspismos, the small leftist party that had spun out of a former broader coalition of the Left almost a decade earlier, after the Communist Party of Greece had abandoned it. Synaspismos (the word means “coalition”) had always been a minor force in Greek politics. A Marxist-socialist party that was pro-Europe, it usually barely managed to scrape up enough votes to overcome the 3% barrier and elect a handful of MPs in parliament. Promoting a platform that included environmental and welfare issues, as well as immigration reform, it was always considered a benign, non-threatening political entity. This was the time of monolithic unilateral governments led by either the Social Democrats of PASOK or the conservatives of New Democracy, giant parties that usually swept a combined 80% of the popular vote. Smaller parties like Synaspismos or the Communists never had real power and were all but inconsequential compared to the behemoths that ruled Greece. Alexis Tsipras rose quickly in those close ranks. He became the secretary of Synaspismos’ youth branch in 1999. In 2004 he was elected a member of the party’s Central Committee. Then, in 2006, party leader Alekos Alavanos surprised many by selecting him to be Synaspismos’ candidate for the mayorship of Athens. Coming up against a cadre of seasoned politicians, this fresh-faced 32 year old managed to get an amazing 10,5% of the vote that was only good for third place, but was considered a triumph for his tiny party. Now everybody knew his name, and everyone recognized his face. Two years after that, Alavanos decided to step down as party leader, and promoted Tsipras as his successor. He proceeded to dominate the internal election getting 70% of the votes against the experienced Fotis Kouvelis, thus becoming the youngest party leader in the history of the Greek republic. At 34 he was in control of a small leftist party in a small country in Europe. For people within his political spectrum, this was as far as one could conceivably get. There are reasons to believe that Tsipras did not consider this the pinnacle of his ambition, however. Journalist Christoforos Kasdaglis, a SYRIZA MP candidate at the Dodecanese in the upcoming election, first met him around that time. “Speaking with him and his close associates”, he remembers, “what stroke me as fascinating was their deep conviction that they would play a significant part in the political evolution of the country. This belief was clearly evident back then, and it surprised me. They obviously did not expect it to happen the way it eventually did but, as it turns out, they were right”. What also became evident at the time was that Tsipras was not above political machinations. Synaspismos was by then the largest member of a broader coalition of about a dozen different Leftist parties called SYRIZA. This coalition participated in elections as a unit, led by Synaspismos’ leader. By the time of the 2009 general election, Alekos Alavanos, Tsipras’ predecessor, was cast aside and would not even be a candidate for a seat in parliament. He would later leave the party altogether. Immediately after the election, which gave SYRIZA a slightly disappointing 4.6% and 13 seats in parliament, Fotis Kouvelis departed as well, going on to create a new party called Democratic Left. Within those few months Tsipras had managed to remove both conceivable internal opponents and consolidate his power within his small organization. This would turn out to be key. Because in the meantime, the Greek economy and the entire Greek political system was about to implode. After Greece requested a bailout from a troika of institutions (the IMF, the ECB and the EC) in 2010, and during its subsequent financial and social woes, the political landscape in Greece has been transformed in a way that may be unprecedented for democratic countries during peacetime. Within 3 years the two giant parties that have governed Greece pretty much non-stop since 1974 lost 64% of their power. PASOK and New Democracy got a combined 5,5 million votes in 2009, and a paltry 2 million in May 2012. New parties came from nowhere to claim hundreds of thousands of indignant votes and bring a disparate stream of political first-timers into the political forefront. Greece has a Nazi party in its parliament now (although most of its MPs are in jail awaiting trial for a series of alleged felonies). A record 43 parties participated in last year’s European elections, 26 of which did not exist the previous time Greece held European elections. As the election of January 25th approaches, even more parties are being set up to participate. Former Prime Minister Papandreou has one. A former television actor who is the mayor of a small township north of Athens has one as well. A popular television journalist has a real shot for the third place spot. PASOK, the party that ruled Greece until 2012, receiving a massive 44% of the popular vote in 2009, may struggle to pass the 3% barrier in 2015. And MPs are changing parties left and right, trading allegiances in frantic attempts to hold on to their seats. None of this is normal. Politics has gone berserk in Greece. It is within this unprecedented turmoil that SYRIZA has soared. The massive wave of discontent among the electorate -or, at least, the majority of it that did not wash over the Nazis- ended up finding shelter mostly in the best known and least polarizing of the small fringe parties that existed before the crisis hit. SYRIZA soared in 2012, getting a 16,8% of the popular vote in May and an unbelievable 26,9% in June, less than 3% behind New Democracy, the party that ended up forming a governing coalition with a diminished PASOK and Fotis Kouvelis’ Democratic Left. “It was not self-evident that SYRIZA would be the one to play the main role” says Andreas Karitzis. “Before the 2012 election, polls showed that the Democratic Left was the frontrunner”. Karitzis attributes this partly to his leader’s political acumen, but other factors have also contributed to this stunning ascent, among which one has to consider luck. For some, unabashed populism was another factor. For the better part of the past few years Alexis Tsipras has been the most vocal opponent of Greece’s agreements with the Troika, as they are described in a series of memoranda signed by the two last governments and the country’s lenders. Those deals have saved Greece from defaulting on its massive debt, and have kept the country afloat during a period in which it is unable to borrow. The price, however, is a series of reforms and austerity measures that Greece has promised to implement, measures that include radical cuts in public spending and unprecedented reductions in wages and pensions. The discontented have flocked to SYRIZA, partially encouraged by Tsipras’ repeated promises to repeal the memoranda and abandon all deals with the troika if and when he is elected Prime Minister. This kind of talk is partially what many have been afraid of, both within Greece and abroad. No matter the cause, SYRIZA’s rapid ascent was not without complications. This was a small-time party with just a handful of experienced members and serious organizational flaws that suddenly blew up to represent a sizeable portion of the electorate, and maybe even govern. The imbalance became evident in the double election of 2014, where SYRIZA was supposed to come up with strong candidates for the European election and for local elections in all cities, townships and prefectures of Greece at the same time. Some high profile rejections, organizational missteps and a mediocre result in local elections (as compared to the broadly disgraced but infinitely more organized in the local level traditional parties) clearly showed that SYRIZA may be on the precipice of power, but sorely lacks in infrastructure and, perhaps, in manpower as well. And this is just one of the doubts people have on the ability of SYRIZA and its leader to govern. In a recent editorial at “Kathimerini”, the newspaper’s editor in chief Alexis Papahelas notes an interesting paradox: A significant number of SYRIZA supporters intend to vote for SYRIZA because they are certain that the party will not follow up on its combative rhetoric. Meanwhile, the incumbent Prime Minister Antonis Samaras and his cohort are once again attempting to scare voters away from SYRIZA, claiming that the party’s confrontational plan can only lead to an exit from the Eurozone and several other states of ruin. Mr. Tsipras’ short-term anti-troika plan comprises of a series of aid packages and pension raises aimed at those most affected by the austerity measures. The plan’s sensibility and the feasibility of its funding are highly disputed, of course, as pre-election relief promises usually are. But, despite the fact that it aims to reverse parts of Greece’s deal with its debt holders, the part of SYRIZA’s program that is getting the most attention is something else entirely: The demand for instant and significant debt relief. Greece currently owes over $300 billion dollars to its creditors, and most of the troika money is meant to pay parts of that debt as it comes due. SYRIZA claims that this debt is unsustainable, and Greece should be relieved by a significant part of it for its economy to be able to grow. This is not an eccentric or far-fetched idea. Indeed, many economists believe that any Greek government would eventually need to request further restructuring of the country’s debt. Many fear, however, that this issue should be dealt with more responsibly, in coordination with the entities that own the debt, without misplaced ultimatums or populist decrees by the debtors. Inside the country many feel that an inflexible stance may prompt Germany to make an example of Greece. The risk of instability at the Eurozone from a possible “Grexit” is significantly smaller than it was in 2012, and a “punishment” of disobedient Greeks may serve as a detractor to similar notions in Spain or Italy. Here is the deal, though: No one knows how Tsipras will handle those issues if and when he does come into power. Whether he is determined to clash with the Troika and Germany and how flexible he is going to be in those negotiations may be what will decide Greece’s place in the Eurozone. But we just don’t know what his reactions will be when he enters the negotiation. The main cause of fear in Greece and beyond is that Tsipras and his party are unknown quantities. People don’t know him as an active politician. And they don’t know what the dynamics -and the limits- of his unusual party can be. Mr. Tsipras declined to comment for this profile. I did speak to several people who have known him for a long time, however, from old comrades and college buddies to current advisors and the guy who cuts his hair, and the common thread of their opinions is this: He is a good guy. Unlike most politicians, he is not arrogant, confrontational or standoffish. He was universally described to me as affable and down-to-earth, friendly and charming, someone who genuinely cares for other people’s feelings. “He is the kind of guy I could hang out with”, says Christoforos Kasdaglis, “and that is something I wouldn’t say for most politicians”. 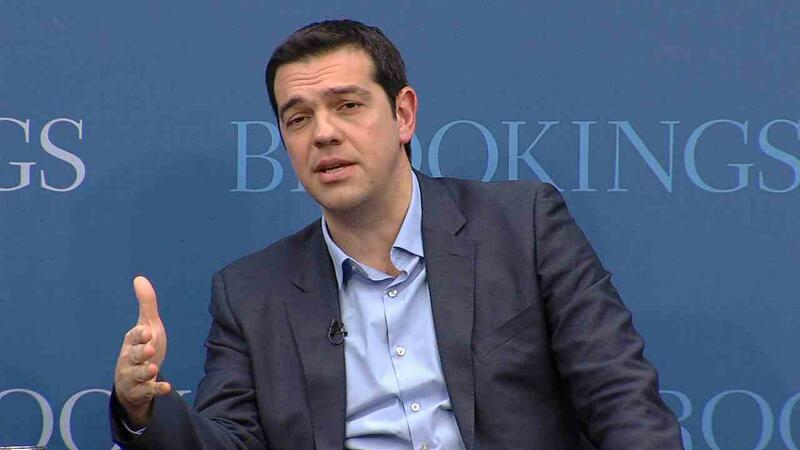 When Tsipras accepts an invitation to speak as a guest at a book signing (as he has done twice for Kasdaglis), he takes the time to read the book beforehand, and makes sure he has meaningful things to say about it. His natural charm, immediately evident everywhere (except, perhaps, during his more aggressive appearances on the pulpit), is not a political calculation -it is apparently genuine. Tsipras, of course, is a Marxist. An atheist who lives with his partner Betty Baziana in an apartment in Kypseli -a rather seedy part of down town Athens- he has not baptized either of their sons, Phoebos-Pavlos and Orfeas-Ernesto, unlike the vast majority of Greeks. Yes, you read that right: He did name his second son “Ernesto”. However, during the past few years he has made concessions to the Greek Orthodox church, a still powerful political entity in the country. He has visited Mount Athos and has appeared in religious functions, gestures clearly aimed to appease a large part of the electorate, but at odds with his personal ideological stance. He has made more controversial concessions to another part of the political establishment in Greece: PASOK. SYRIZA has slightly opened up towards the centre-left, allowing some former members of the once dominant party to bring their expertise -and their loyal voters- to the fold. This election cycle the party’s openness was further enhanced, raising dissenting voices from the pure radical and communist minorities within it. One example was the inclusion of controversial MP Rachel Makri in the party’s candidate lists. Makri comes form the far-right “Anexartiti Ellines” (“Independent Greeks”) party, and has expressed clear anti-immigration and anti-semitic views in the past. Tsipras’ ability to adapt has been emphasized to me by almost everyone who has worked with him. “He is not reckless”, said Andreas Karitzis. “He can read most situations and realize what can be achieved under the circumstances. He is like a chess player”. And he has evolved. Ever since he became the leader of SYRIZA, Alexis Tsipras has been meeting and talking with a series of mentors and experts on a variety of issues and topics. “During the past six years he has become sophisticated and knowledgeable” one of his more infrequent advisors told me. “He began with a narrow field of knowledge, but he is open and eager and has been able to achieve much in a very short period of time”. Apparently, he has also radically improved his mastery of the English language, an issue of much debate in the past. Few can forget his repeated mentions of a “frozen war” between the United States and the USSR at a speech at Columbia University two years ago. Tsipras has also been more than willing to repeat that a unilateral exit from the Euro is not part of his negotiation toolkit. “Alexis Tsipras believes that every policy he pursues can and should be implemented within the structure of the European Union” says Yiannis Roubatis, a former journalist, MEP, an on-and-off interlocutor of Tsipras’ during the past six years. On the other hand, his detractors are eager to point out two things: His lack of experience or objective credentials, and possible pressures he may face from his own party. “There is a part of SYRIZA that Alexis Tsipras does not control”, an opposing MP told me. “If he strays too much towards compromise, they will not follow him willingly”. SYRIZA, you may remember, used to be a coalition of several small parties, some of which are to the left of Tsipras on the political spectrum. As mentioned, they have already revolted against the excessive infusion of former PASOK members to the party, and have an even stronger anti-troika stance than their leader. Some of them do not share Tsipras’ devotion to the European ideals. Or to the Euro. At the same time his critics stress his lack of experience in dealing with the internal mechanisms of the Greek state, as well as handling international relations. The previous generation of Greek Prime Ministers, (Papandreou, Samaras, Simitis & Karamanlis) were all educated abroad and, with the exception of Karamanlis, had all served in cabinets before becoming Prime Ministers. “This is not just about Tsipras”, a former minister also told me. “SYRIZA does not have enough prominent, experienced, efficient and serious members to fill an effective cabinet”. This was a real issue within the party in 2012. When it became clear that SYRIZA had a small chance at winning the election, many party members were horrified. Alexandre Papanicolaou & Emilie Yannoukou’s documentary “Hope on the Line”, that followed Tsipras from June 2012 to June 2013, features a scene from election night in which party members claim that the loss was preferable. “We weren’t ready”, someone mutters. Tsipras disagreed then. He feels even more ready now. “Is he ready to govern”? I asked one of his advisors, who has worked with several Greek Prime Ministers. “Let me put it this way”, he said. “He is more ready than Papandreou or Samaras were, when they took on the office”. This, of course, remains to be seen. No matter what happens, no matter what the repercussions will be in Greece, the eurozone and the EU, for one shy boy who 24 years earlier was fighting for his right to cut class, this has been a spectacular journey.